illus. by Karen Patkau. 24p. (See to Learn). further reading. Groundwood. Mar. 2019. Tr $16.95. ISBN 9781554988792. 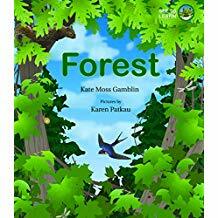 Gr 1–5—Drawing on her doctoral research in sustainability and her international teaching experiences, Gamblin has written a picture book that doubles as a love letter to the forest ecosystem. The gentle second-person narration is intimate and conversational: every page begins with the question, "Do you see? "pulling readers and listeners into the world of the forest, where they might encounter "the swoop of the swallow in flight" or "the delicious sunlight, giving way to the soft darkness of night." With reading suggestions for young and older readers, this beautiful nonfiction picture book will be a useful jumping-off point for inquiry and land-based pedagogy. The illustrations are lush and patterned, and the rich interplay between the text and images allows for this story to work well for read-alouds and silent reading. VERDICT A strong purchase for schools and libraries to encourage connection with the natural world.